Former MLB All-Star pitcher Esteban Loaiza was sentenced to three years in prison Friday for felony drug possession after more than 40 pounds of cocaine were found in his rented townhome in Imperial Beach, California. Loaiza, 47, pleaded guilty to one felony count of possession of cocaine with intent of distribution in August 2018 in San Diego County. His sentence of three years in prison and five years on probation was far less than the minimum prison sentence of 10 years he faced but, ahead of the sentencing, his lawyer was confident his penalty would be reduced. Once released from prison, however, Loaiza will be deported to his home country of Mexico, according to U.S. District Court Judge Janis L. Sammartino. For now, Loaiza is allowed to remain free on bond. He was ordered to report back to authorities on April 19. The baseball star was arrested on Feb. 9, 2018, after San Diego County sheriff's deputies found a "sophisticated," rear cargo compartment used to hide contraband in his minivan. The minivan was parked in the garage of the ballplayer's home; on top of the vehicle were baseball bags bearing Loaiza's name. Later, authorities obtained a search warrant for the home he rented in Imperial Beach, an oceanfront city in south San Diego, where officials said packages containing a white powder believed to be cocaine were found. According to details in the government’s sentencing memorandum, Loaiza’s rented townhouse was described as a “stash house” used to distribute the drugs. The home didn’t contain furniture or personal belongings. Loaiza was originally charged with possession of more than 20 kilograms (about 44 pounds) along with two counts of transporting and possessing narcotics with the intent to sell — all felonies. In his plea agreement, the athlete admitted to driving a Mercedes-Benz SUV that he knew contained cocaine. He transported the drugs to his home in Imperial Beach and transferred the drugs to another car at the property, and intended to transport the cocaine to another person. 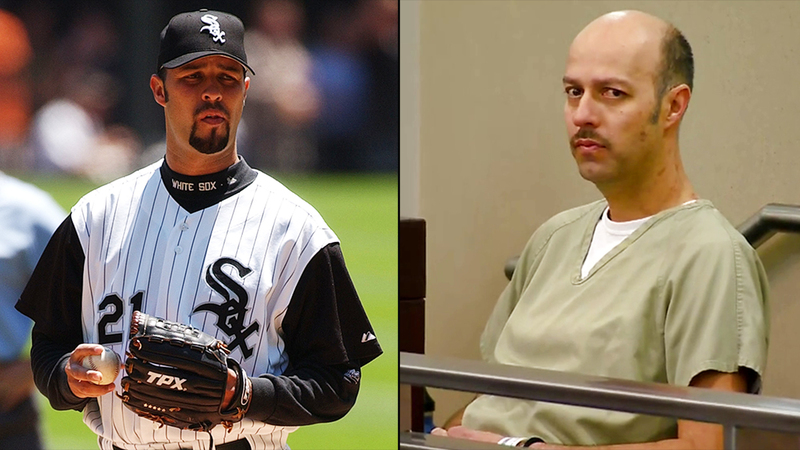 Esteban Loaiza in a Chicago White Sox uniform in July 2004 (L) and in at a previous state court appearance on drug possession charges. U.S. Attorney Robert Brewer, of the Southern District of California in San Diego, said this case marks Loaiza’s fall from grace. DEA Special Agent in Charge Karen Flowers said Loaiza “lived every young boy’s dream” with his career as a baseball star. But that life is long gone. “That quantity represents tens of thousands of doses of a highly addictive drug that so often has a devastating impact on the lives of so many - not only in our community but well beyond,” Casper added. Given Loaiza’s background, fame and wealth, Casper also noted that this case is different. Born in Tijuana, Mexico, Loaiza attended Mar Vista High School in Imperial Beach. After his 1995 debut in the major leagues, he went on to pitch for the Pirates, Yankees, Oakland A's, Dodgers, White Sox and others. Loaiza was also the husband of Jenni Rivera, the Mexican-American pop star who died along with six others in a 2012 plane crash. The 43-year-old superstar filed for divorce from Loaiza two months before the crash.